Preparations for a Possible Third Nuclear Test Continue; Complications from Water Buildup? A 38 North exclusive with analysis by Jack Liu, Nick Hansen and Jeffrey Lewis. With North Korea’s long-range rocket test earlier this month and an expected U.S. effort to seek a tough response at the United Nations, concerns have grown that Pyongyang might conduct its third nuclear test. 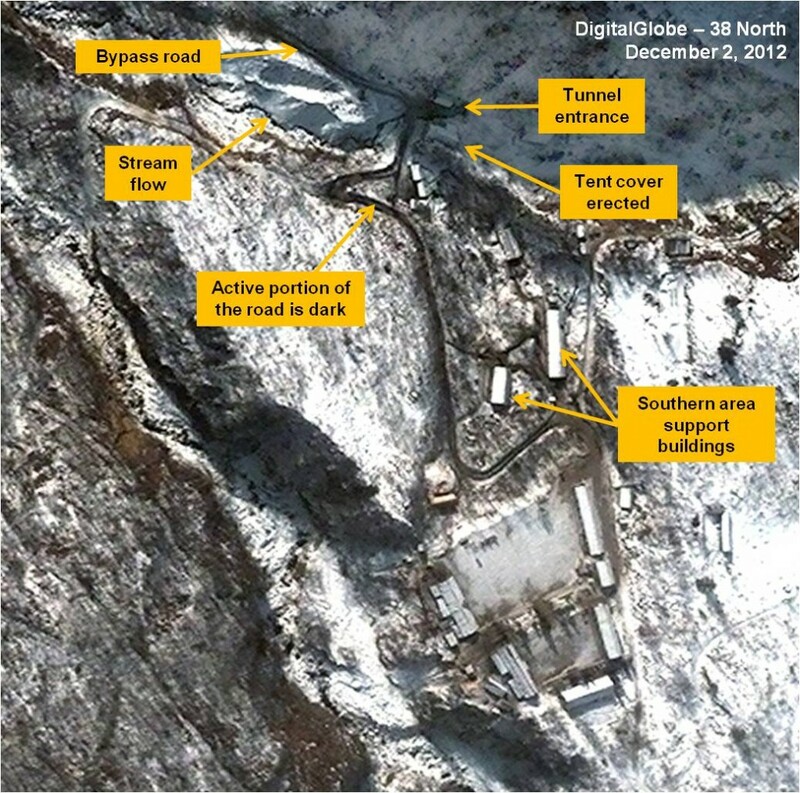 Satellite photos as recent as December 13 show that Pyongyang is determined to maintain a state of readiness at the Punggye-ri nuclear test site where a third test is expected even in the dead of winter. That effort includes a previously unidentified structure that may be intended to protect data gathering equipment from inclement weather. Despite flooding last summer and fall that destroyed key elements of the infrastructure at the site, the North moved quickly to restore their ability to operate the complex. Subsequent images from December show continued activity. 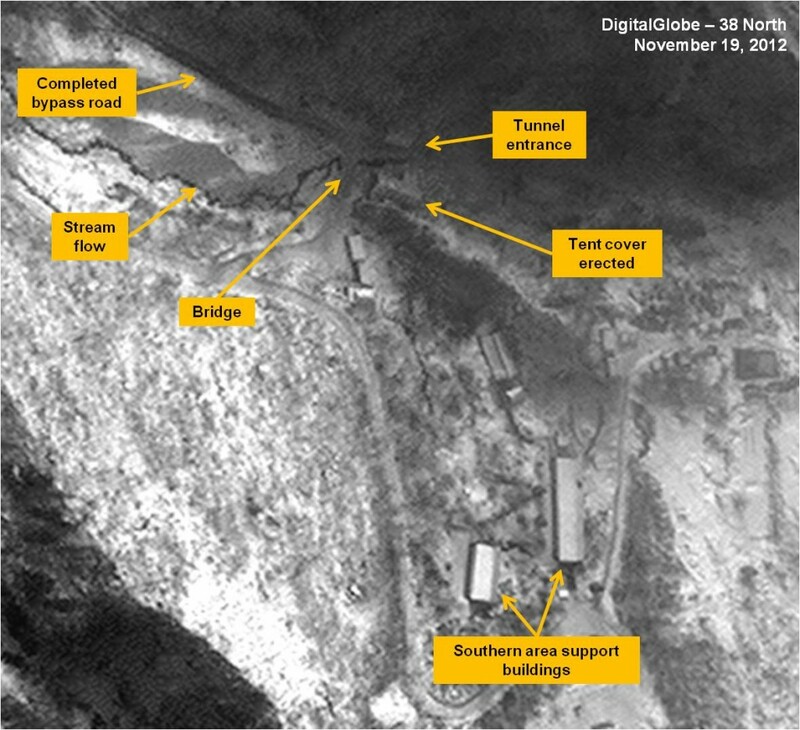 While the North may be able to trigger a detonation in as little as two weeks once a political decision is made to move forward, water first spotted streaming out of the suspected test tunnel in a November 19 satellite photo and still present almost a month later, may present a problem for Pyongyang. In order to maintain a high level of readiness, the North Koreans will have to prevent water buildup in the tunnel that could possibly damage the nuclear test device and associated sensors designed to gather data on a detonation. Whether this potential problem is under control or has now been solved remains unclear. New Analysis of Past Activity at Test Site: Structures Identified? 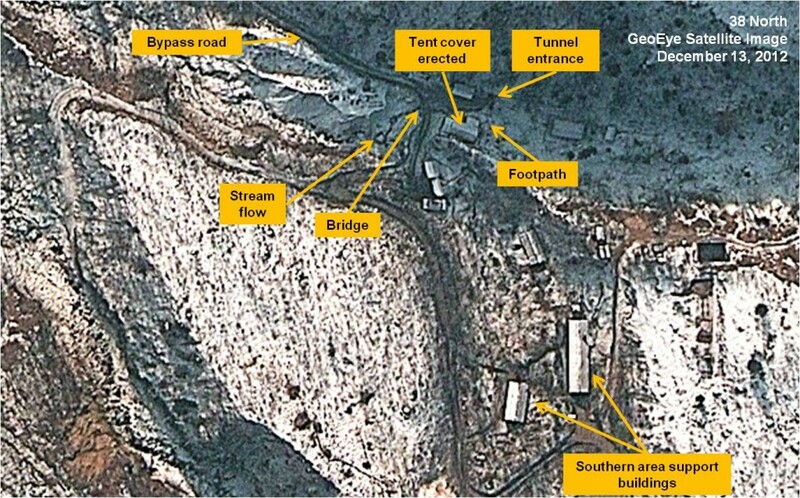 Operations at the southern tunnel site at the Punggye-ri Nuclear Test Facility, where experts suspect Pyongyang will conduct its next detonation, began in 2009 or 2010. Over time, some 8,000 cubic meters of rubble were excavated with spoil piles covering 4,000 square meters. By spring 2012, the site appeared almost ready for a test. A satellite image from April 18 shows a train of mining carts on top of the spoil pile and random unidentified structures or objects on or near the piles (see figure 1). Such patterns may be indicative of preparations to emplace the nuclear device and diagnostic equipment in the test chamber as well as to deliver stemming material and spoil to seal the shaft. Figure 1. 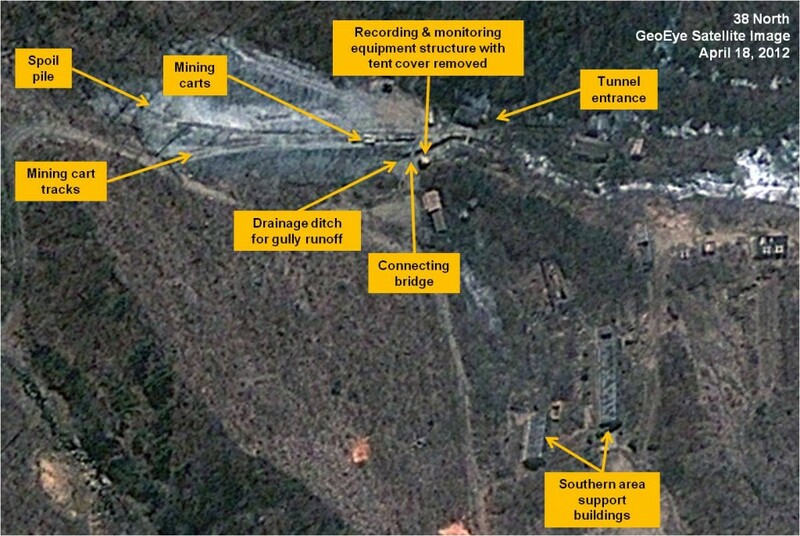 Punggye-ri nuclear test site, April 18, 2012. A comparison of the pile taken over a six-week period from the beginning of March to mid-April 2012 shows a high level of activity as spoil was extracted from the tunnel (see figure 2). The vehicles, structures, and unidentified objects were at different locations in each image indicating movement. Figure 2. 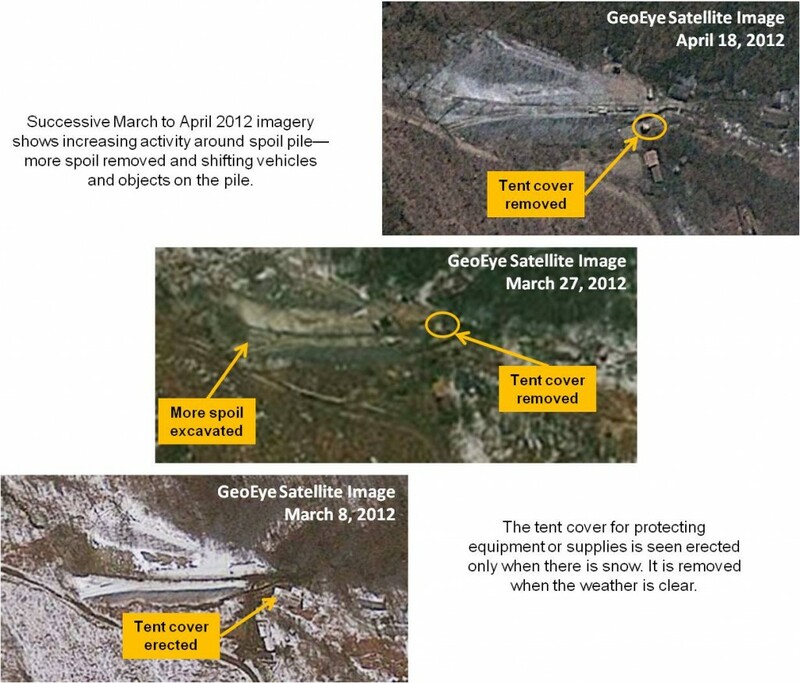 Comparative look at spoil and tent cover activities, March-April 2012. The above images also reveal what appears to be a tent cover or awning not previously identified in satellite imagery analysis. The structure, near the tunnel entrance, is perhaps 20 meters long and 10 meters wide and probably erected in inclement weather—such as snow—and otherwise removed. One possible explanation is that the cover protects recording and monitoring equipment just outside the tunnel. Sensors inside the tunnel and on the nuclear device itself, designed to collect data just prior to detonation, will be destroyed by the blast. Electrical cables from these sensors transmit the measurements to the recording and monitoring equipment outside the tunnel that can survive the test. The structure may also serve as a protected receiving area for items to be emplaced in the tunnel. A box-like object is visible when the tent cover is removed (see figure 3). This structure may contain racks of recording and diagnostic equipment. That would be consistent with practice in the United States and elsewhere. The test monitoring package needs to be near the tunnel entrance in order to keep the electrical lines between the sensors in the test chamber and the monitoring equipment as short was possible given the very transient phenomenon of a nuclear detonation. The recording and monitoring equipment would then pass the processed signals to the control center, perhaps two buildings, labeled southern area support buildings, where scientists and engineers would be at their consoles to control and monitor the test. A newly emplaced larger structure is also visible in the October 3 imagery. With the onset of snow, the tent cover is in place. If our analysis that the tent and box-like object are related to recording and diagnostic equipment is correct, this new structure may contain consoles or workstations run by engineers for calibrating the sensors in the tunnel and the recording and monitoring equipment in the box next door as well as to ensure they are working properly. (There is a footpath barely visible in the December 13th imagery running from the right side of the tent to the tunnel entrance.) During the test itself, there would be no personnel in this structure because of its proximity to the tunnel entrance. If the box and larger structure are related to test monitoring one possibility is that the North Koreans would make the structures transportable so that the equipment could be used at various sites. Instead of building temporary structures, it might make more sense to use standard size shipping containers to house and transport the sensors. Indeed, both structures are similar in dimensions to standard size Conex containers that could serve this purpose and which the North Koreans are known to use for commercial shipping as well as to carry tanks of rocket fuel. Recovering from Storm Damage: A Water Problem? Rainfall during the summer and into early fall washed away much of the spoil pile as well as a considerable part of the access road and its bridges. Imagery from October 3 shows a concerted effort to repair the damage just two weeks after the last typhoon struck. A new access bridge had been erected, and construction of the new bypass road started. The washed out spoil pile provides an indication of the huge quantity of rock excavated from the tunnel. Figure 3. 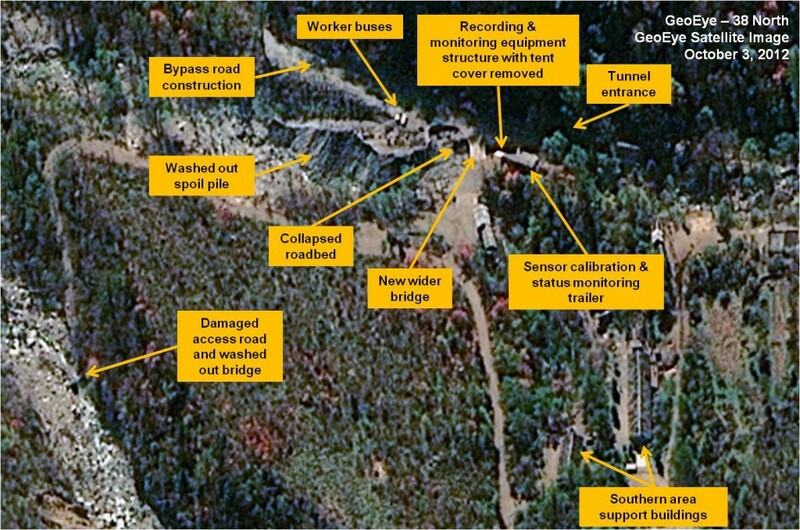 Flood damage and possible test monitoring equipment near tunnel entrance, October 3, 2012. By November 19 (see figure 4), a little more than seven weeks later, the repair effort seems to have been completed. Tire tracks now run from the bypass road to the southern area support buildings. The new bridge appears to be wider than before. The tent cover has been raised with the snowfall. One interesting development is the stream of water running from a location close to the tunnel entrance (a December 13 image shows it coming from the tunnel itself), under the bridge, and down the valley that is also discernible in subsequent images even with snow cover. The stream is noteworthy for two reasons. First, if water is seeping into the tunnel, the North Koreans will have to continuously run pumping equipment and drainage to pass the water through each sealable segment of the tunnel. It is important to remove the leaking water as well as to address the resulting humidity and condensation on the sensors in order to prevent the tunnel from flooding, possibly damaging the nuclear device, and to ensure that the sensors emplaced along the tunnel work properly. Secondly, the stream of water indicates that the volcanic rock of the mountain may be porous or fractured enough to release radionuclide byproducts from a nuclear detonation that would allow foreign monitoring to distinguish whether the device uses highly enriched uranium or plutonium. Figure 4. Test tunnel entrance, November 19, 2012. Image © 2012 DigitalGlobe, Inc. Figure 5. Activity near tunnel entrance, December 2, 2012. Imagery from December 13—almost two weeks later—provides the best view of the area to date. The tent cover is clearly shown. The stream of water runs along the topside of the tent structure and appears to originate from the tunnel. No discernible vehicle tracks enter the tent area. There are three possible explanations: 1) all necessary equipment for a test is in place in the tunnel; 2) no attempts to install new equipment have been made since the last snowfall the first week of December; or 3) the tent area is indeed not used for staging. The trace of an apparent footpath runs from the right side of the cover to the tunnel entrance, indicating that workers have been moving between both areas. Figure 6. Activity near tunnel entrance, December 13, 2012. The North Koreans have restored the capability to conduct a nuclear test at the south tunnel of the Punggye-ri Nuclear Test Facility in the aftermath of rains this past summer and fall. They continue to maintain the test site at a state of readiness that could allow them to conduct a detonation as soon as two weeks after such a decision is made. One wildcard, however, is the stream of water that appears to be coming from the tunnel entrance, indicating a possible problem with seepage, that could adversely affect a nuclear device and sensors intended to gather data on and monitor the test. Whether this problem is under control or has been solved remains unclear. This article was made possible in part by a grant from the Carnegie Corporation of New York. The statements made and views expressed are solely the responsibility of the author(s). Frank V. Pabian and Siegfried S. Hecker, “Contemplating a third nuclear test in North Korea,” Bulletin of the Atomic Scientists, August 6, 2012, http://thebulletin.org/web-edition/features/contemplating-third-nuclear-test-north-korea. The presence of mining carts alone would probably mean digging was continuing. The random placement of other objects or vehicles on top the spoil pile may mean that additional activities may have been ongoing. There may be several sealable tunnel segments or chambers to mitigate the effect of the blast and prevent it from escaping into the open. Each segment of the tunnel is plugged with stemming material and accessed through a blast door, emplaced in the stemming material.